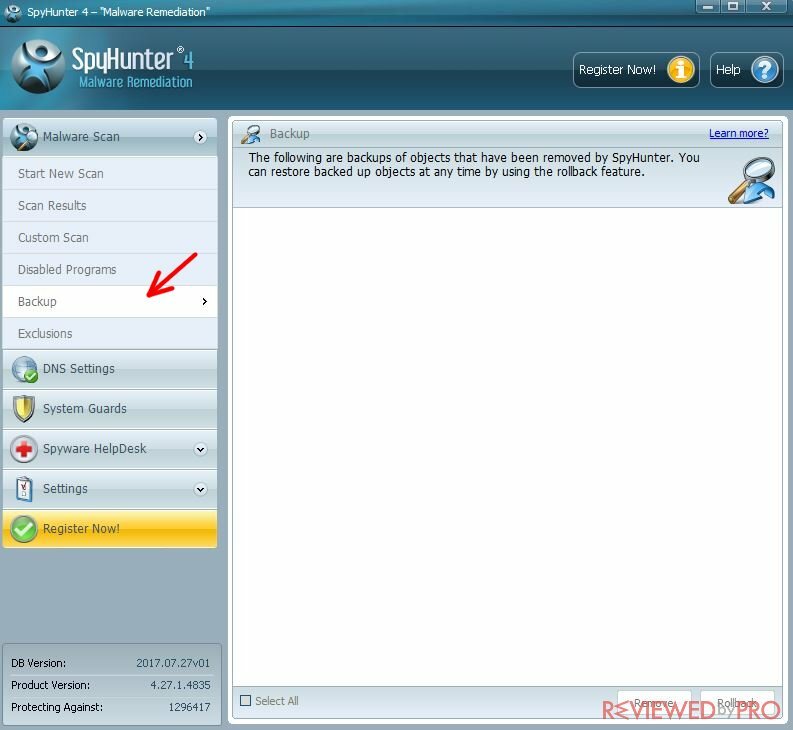 This is a guide to help you use SpyHunter. It will explain how you can get the installer, install it on your computer and use its main features. To start using the software, you need to download its executable file from this page. 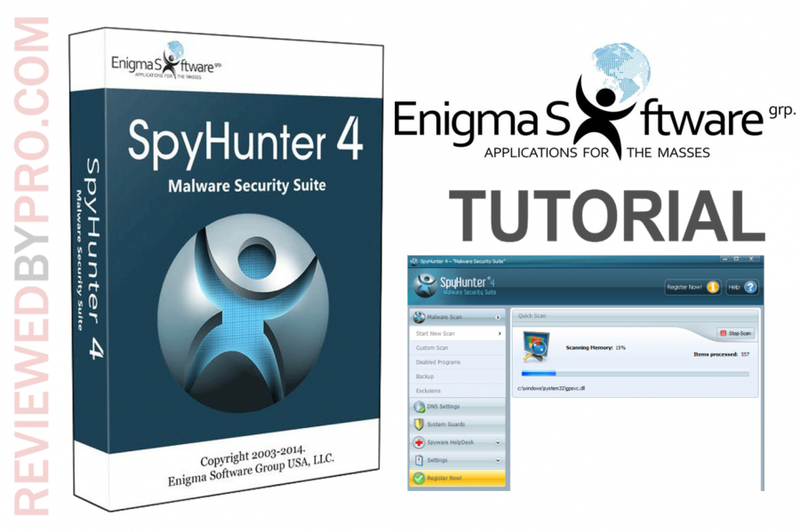 The latest version of the program is called SpyHunter 4. To download it onto your computer, click ”Download Scanner”. 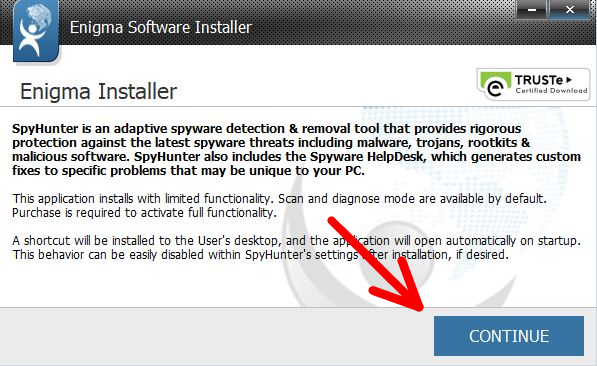 You can also click on “Buy Now” button to install the paid SpyHunter version. Keep in mind that it offers a wider range of features. The installation process of the software is not complicated. 1. The very first step you need to do is to open a file which you downloaded to your computer. 2. 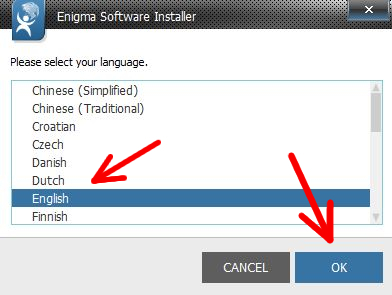 After opening it, you will be asked to choose your language. The installation should last only for a few seconds. 5. 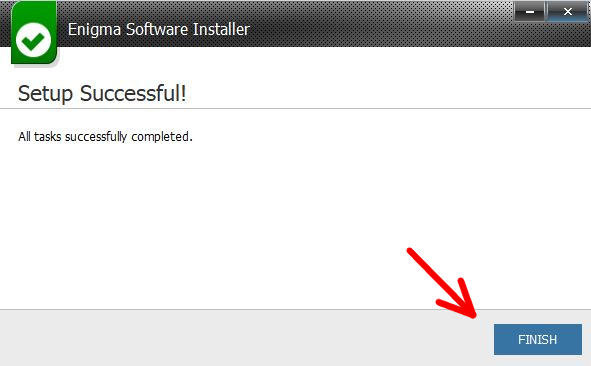 After the installation is complete, click on “Finish”. 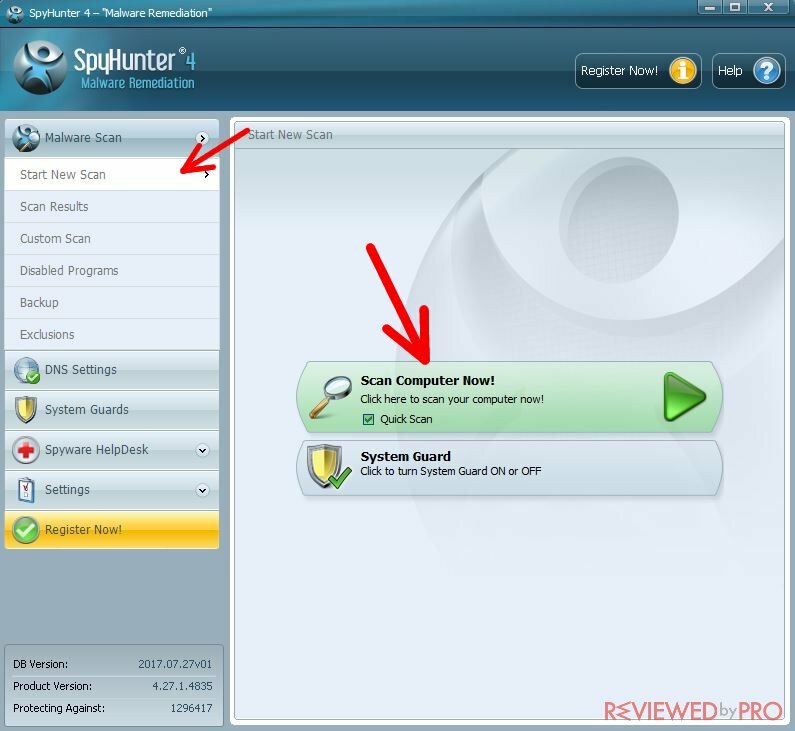 SpyHunter 4 will start automatically and will perform its first computer scan. 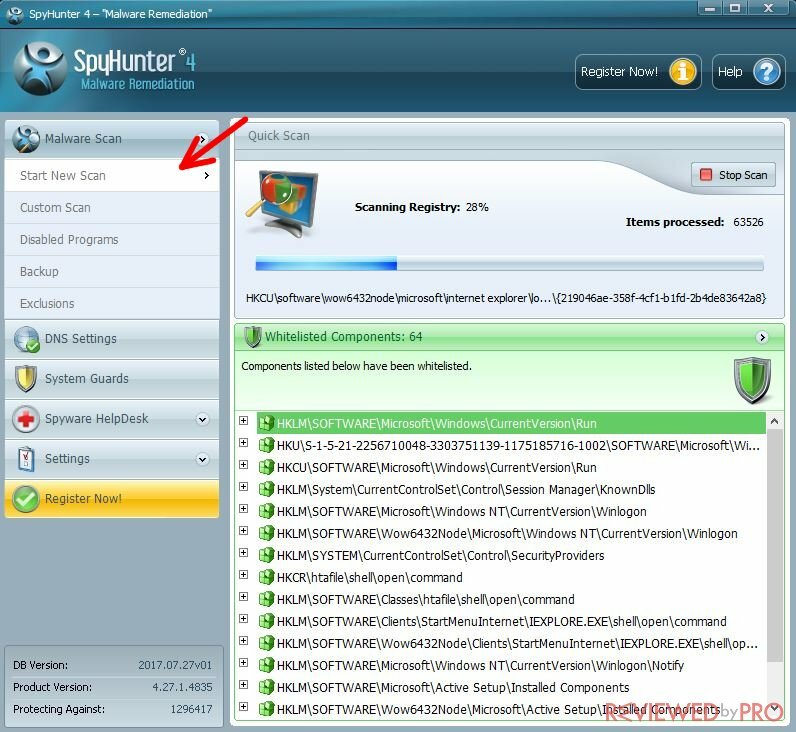 Malware Scan – to launch a system scan, you need to select “Start New Scan” option. Quick Scan feature helps to perform a fast scan. Scan Results section reveals the information from the last scan. Custom Scan lets you choose the areas which you need to scan, for example, memory, registry, or others. Disabled Programs lets you disable or enable unknown programs. 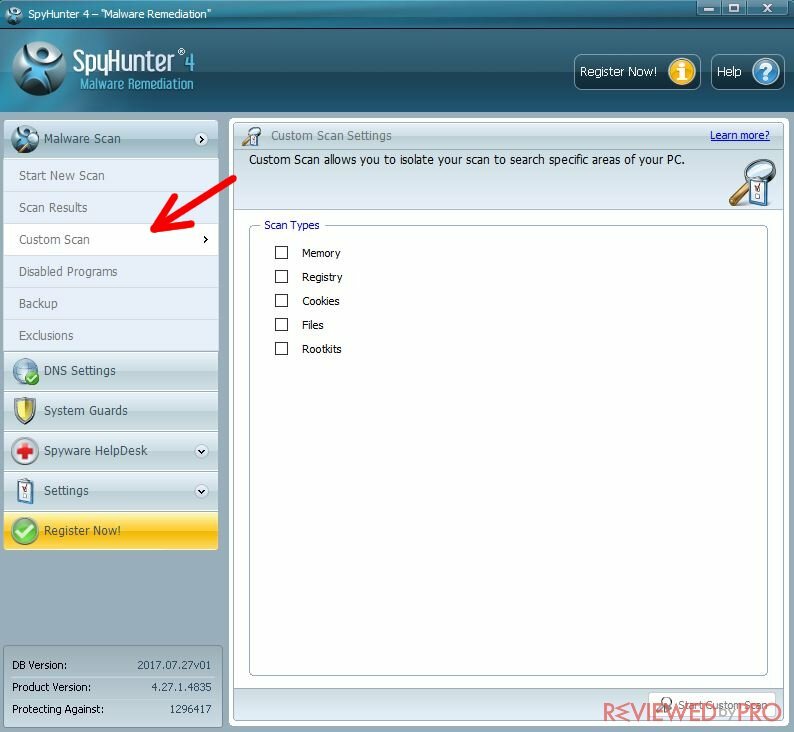 By selecting Backup, you can restore files deleted by SpyHunter without your approval. The Exclusions section lets you create your own list of programs which you want to keep whitelisted. 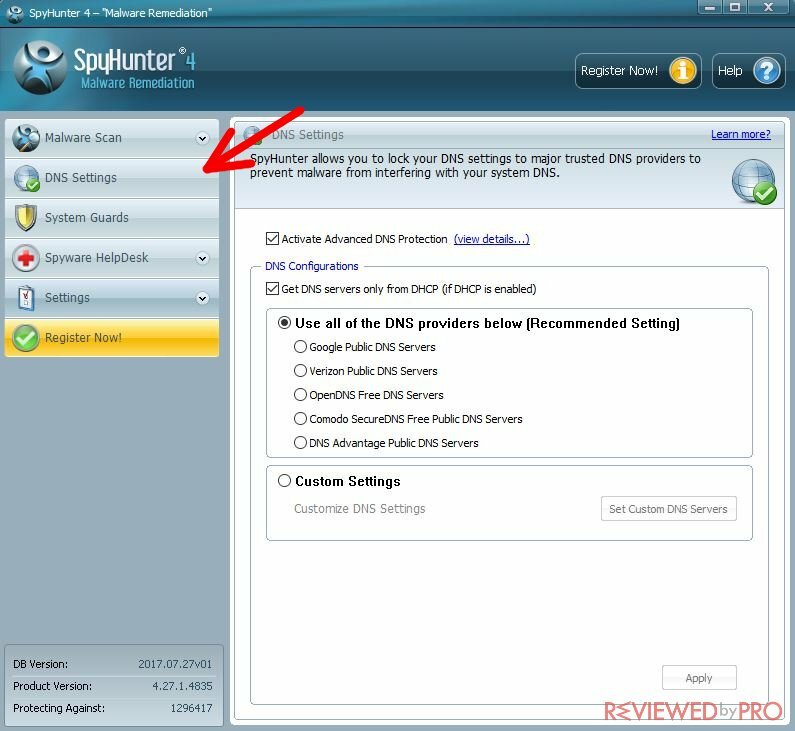 DNS Settings – here you can change the DNS server settings and prevent malware from interfering with your system. You can set your own settings and set custom domain name system servers by selecting “Custom Settings”. However, if you are an inexperienced PC user, we strongly recommend you to use the first, recommended settings, option. System Guards – here you can find the information about various processes running on your computer. All the safe processes are kept under “Safe Items” category. They are considered harmless and, usually, cannot pose any danger. In the meantime, the list that you can find under “ActiveX Guarded Items” is considered malicious. These objects should be either removed or blocked. However, you can also allow them. For that, click on “Select All” or select unwanted processes manually and hit “Remove”, “Allow” or “Block”. 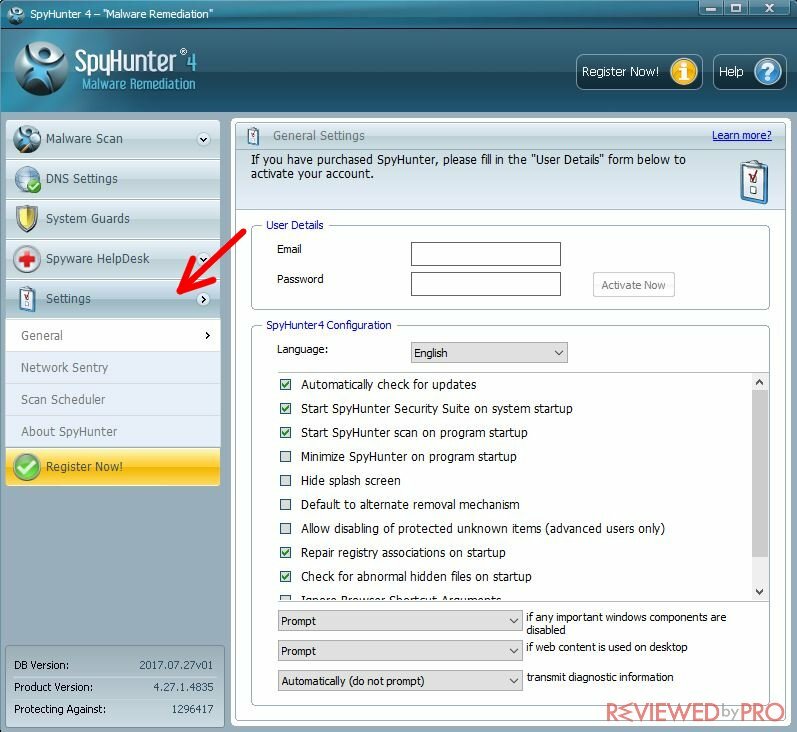 Spyware HelpDesk – this is a unique feature of SpyHunter which helps you receive help from malware experts at any time . It is especially valuable when you struggle with a serious malware attack or need an answer to a software-related question. 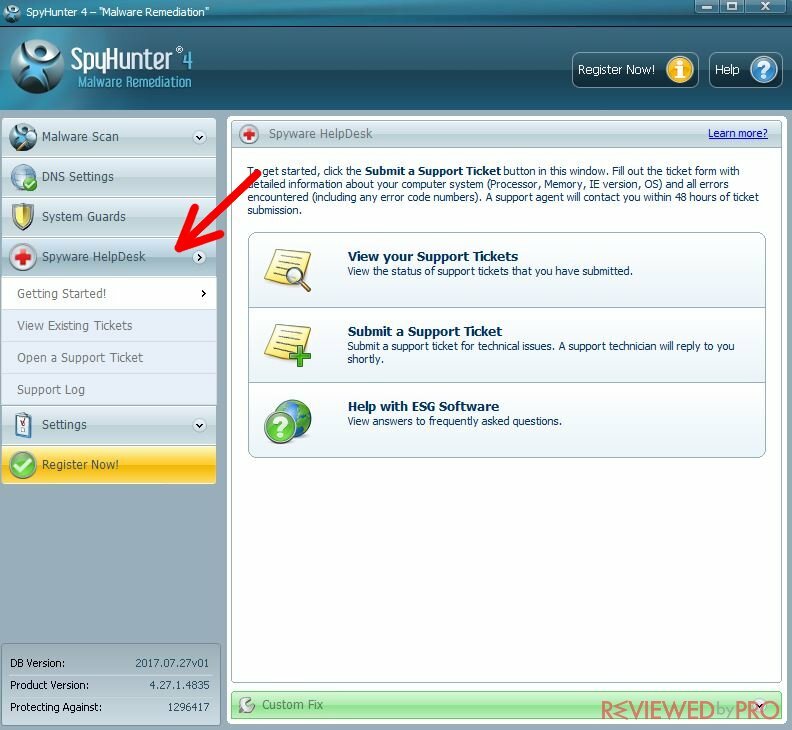 However, we strongly suggest you check the “Help with ESG Software” section before submitting a support ticket. There is a big chance that someone had an identical problem as you. Settings – this section is designed to help you change the program according to your needs. Here, you can activate your account by adding your user details or configure additional settings, such as language, automatic updates, automatic system scan and more. 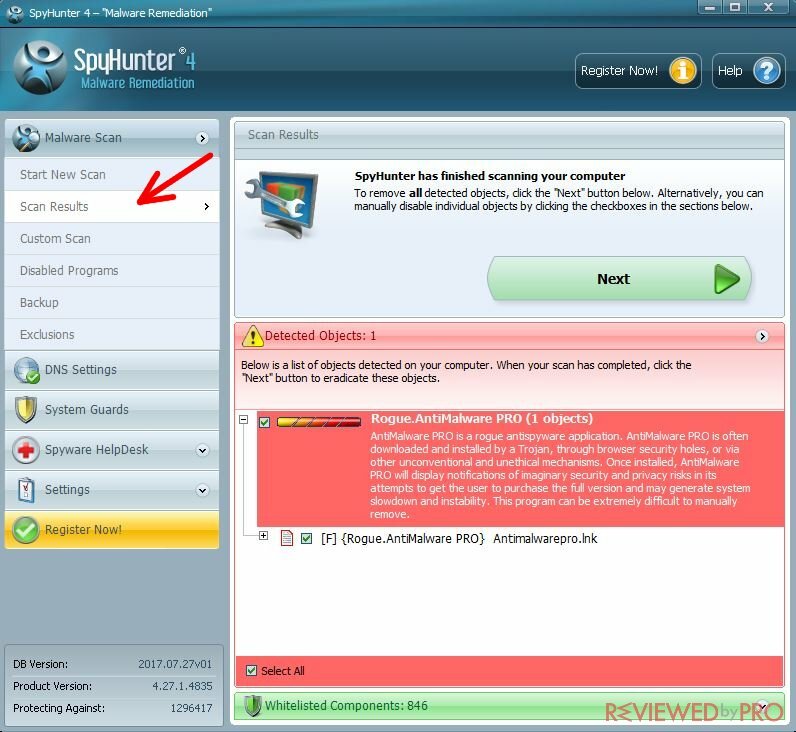 To perform a full system scan with SpyHunter 4, you need to click on Malware Scan on the upper left corner. Then you have to choose Start New Scan in the sub menu and a Quick Scan option. You can click “X” on the top right of the program’s window to minimize it and continue the scan in the background of the system. After a full system scan, you will see a list of malicious objects on your computer. Of course, you need to remove them. If you used the free SpyHunter version to scan the system, you have two options: you can either remove these malicious objects manually or purchase a full version of the program and get rid of the threats with only one click. If you are using a paid SpyHunter version, click “Next” to remove all the objects detected. There are a few ways of getting a full version of this anti-malware app. You can either click on “Register Now!” button, which is given in the main menu of the software, or go straight to their website. ckout page. Here, you will need to fill in your credit card information and similar details . After that, click on the “Proceed” button at the bottom of the page. 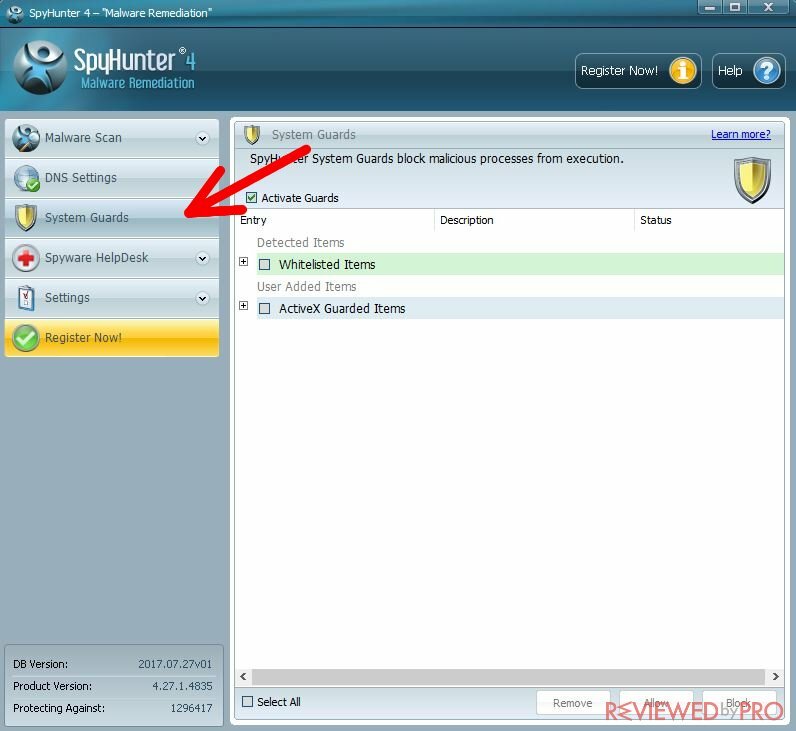 After completing your order, enjoy all the features of SpyHunter! 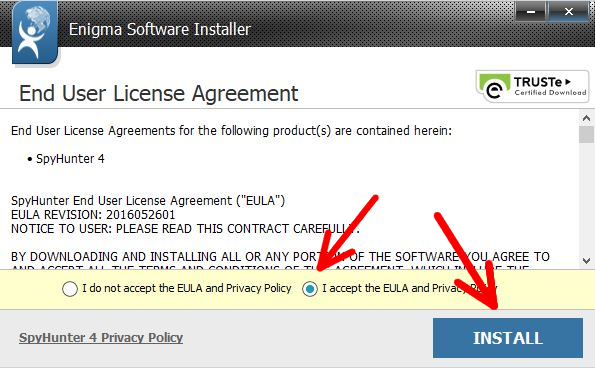 ^ The Software License Agreement (or EULA) Dissected and Explained. How to Geek. A website for geeks. ^ Spyware HelpDesk explained. Enigma Software. The official page. 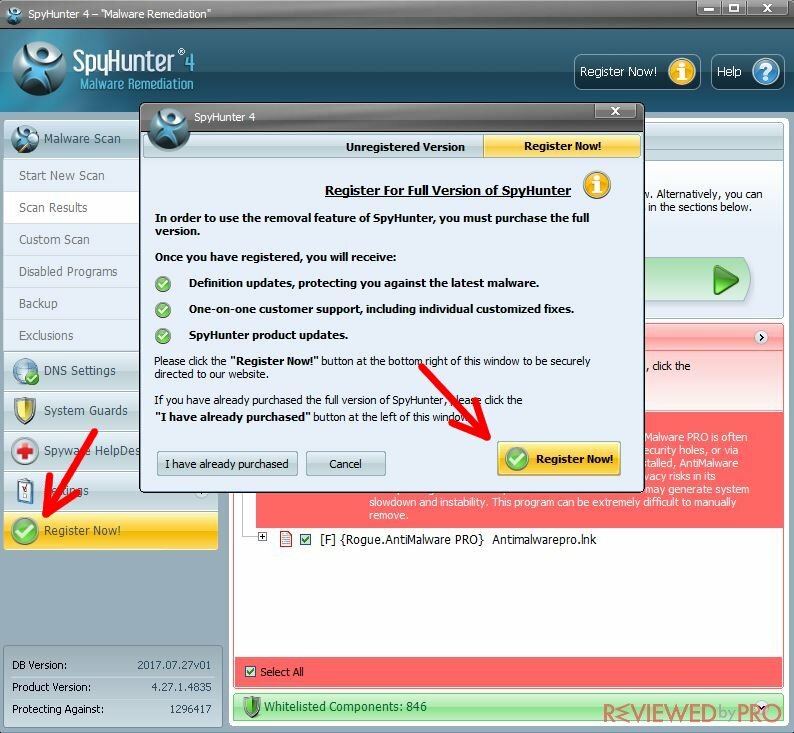 ^ SpyHunter.Customer information. Enigma Software. The official page.